A wayside signal is basically any signal - electrical, mechanical or otherwise - in a fixed location outside a train along the track. When the CTA® inherited the elevated system in 1947, much of the system still operated "on sight", which depended on the motorman's comprehension of and compliance with safe following distances and the rules governing them. To aid their judgment, the "L" used "spacing boards" to give the motorman a point of reference. The State Street Subway, which had opened in 1943, had the most advanced system at the time, a Automatic Block Signal System. This electro/mechanical system provided more protection and a fail-safe device to stop noncompliant motormen, as well as signals to visually convey instructions. Later, the CTA® upgraded to an Automatic Train Control System, which provides instructions electronically not only on wayside signals but also in the motorman's itself. Most of the CTA® employs this system, though the Dearborn Subway and Forest Park (Congress) branch still use the ABS system they were built with. The CTA® intends to covert them to ATC in the near future. Although the Metropolitan main line and part of the Northwest Branch were originally equipped with an early (and then-quite advanced) Rowell-Potter block signal system, it remained in use for only about a decade. In 1908, the Met installed spacing boards on its system. "...if two trains a thousand feet apart are both running at the same speed, say twenty miles per hour, and the first train comes to a sudden and unexpected stop, the motorman of the next train, if attending to duty, will note instantly that the preceding train has stopped due to the fact that he cannot see the next signal ahead. The distances between the signals are ample to allow a stop being made in time to prevent collision." The city's other elevated companies also quickly adopted spacing boards. The devices remained in used until the 1970s when electronic cab signals finally phased them out. The earliest automatic block signals used on the system were on the Metropolitan West Side Elevated's main line and part of the Northwest Branch. The Rowell-Potter signals were used only until 1908. The first extensive use of automatic block signal system on the "L" came when all five double-track miles of the State Street Subway were equipped with them in 1943. This improved version of the ABS system had a three-aspect signal, each fitted with a left side mounted track trip to engage a spring-loaded carborne trip valve on any train passing a restrictive indication (signal). On the 4000-series cars (which used air brakes), an emergency stop was triggered when the track-mounted trip arm caused the brake pipe on the train to vent to atmosphere. In the case of the more modern all electric cars, the track trip would strike the side trip lever on the train, activating the electrical emergency braking system. To insure adequate protection, circuitry was overlapped to protect the rear of a train by the space between two blocks, not just one. (A "block" is the area between two signals.) Thus, if a train somehow managed to pass one signal without being stopped, there was still adequate time for an emergency stop to be enacted. If so authorized, a motorman may operate a track trip manual release on the wayside signal to override the ABS system, causing the trip to lower. The ABS system was also installed in the Milwaukee-Dearborn Subway, which opened in 1951. The Congress Line received them in 1958 and the same year, the old Met Logan Square line received them from the subway portal at Evergreen/Milwaukee to the Logan Square terminal. This meant that the entire Congress-Milwaukee A route was equipped with an ABS system, the only line in Chicago to have such a system for its entire length. Expansion of automatically signaling lagged for some time after 1958. In 1964, the first speedometers were installed on the new 2000-series cars, as well as a few other experimentally on other car types. At the same time, breakthroughs were made in the fields of solid state electronics and audio frequency track circuits. This allowed the development of the automatic train control system. In ATC, wayside equipment detects the presence of trains or other speed-limiting factors and send electronic commands dictating the maximum speed a following train may operate through the rails. These signals are picked up by equipment on a train and compares it to the actual speedometer reading. If the actual speed exceeds the maximum allowed speed, visual and audio displays alert the driver to lower his speed. If the driver fails to stop or reduce his speed, a penalty full stop is imposed. The ATC system is in continuous contact with each train, not just when a train passes a fixed wayside signal as with the ABS system. Therefore, speed commands are updated continuously and will alter as soon as conditions ahead change. The installation of the ATC system was 40% less than the estimate of what it would have coast to install an ABS systemwide. The first installation of the ATC was on eight miles of the Lake Street Line from Harlem to the Chicago River in 1965. The Dan Ryan and Kennedy Lines had them when they opened in 1969-70 and starting in 1975, the rest of the system was converted line by line, covering the "dark" (unsignalized) trackage bit by bit. Some Color Light Interlocking Home Signals are on high standards, one unit above the other; others are on low standards, one unit along side the other. Regardless of whether the signals are high or low, it is the position of one light above the other that governs the indication. On both types, the upper light indicates for the main route and the lower light indicates for the diverging route. The number plate on signals is considered part of the aspect. a. "X" on a number plate indicates that a train may not proceed past a "stop" indication until further notice as been given. b. Absence of an "X" on a number plate indicates that after making a stop at a "stop" indication, a train may proceed with caution past the "stop" indication. NOTE: Illustrations of color light aspects in this folder do not indicate whether signals are high or low; they show the lights in relation to each other and the number plate. Proceed with caution on main route, prepared to stop at next signal. Proceed with caution on diverging route, prepared to stop at next signal. Proceed with caution, prepared to stop within vision. Stop; operate Track Trip Manual Release. When trip clears, proceed with caution at restricted speed. Proceed with caution prepared to stop at next signal. Proceed with caution at or below allowable speed. Proceed with caution on main route, at or below allowable speed. Proceed with caution into stub track prepared to stop within vision. Stop; proceed through crossover at restricted speed. Thanks to Peter Christy, former CTA® badge #23234, for sending me a copy of the pamphlet. Starting in October 1977, the CTA® began issuing small rule books to its operating employees, listing regulations governing such things as General Information (uniforms, badges, etc. ), Dealing with Passengers (fare collection, transfers, smoking rules, etc. ), Equipment (lights, air comfort, etc. ), Wayside Signals and Interlockings (definitions, aspects, etc. ), and more. 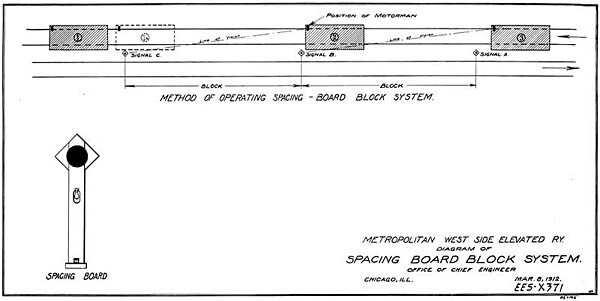 In the revision dated March 17, 1985, the section concerning signal aspects gives illustrations of typical elevated rapid transit wayside signals. The diagrams are mostly the same as in the 1959 pamphlet with only minor modifications. Proceed expecting to encounter stop aspect at next signal. Proceed expecting to encounter end of track or train ahead. Proceed on main route, expecting to encounter stop aspect at next signal. Proceed on diverging route, expecting to encounter stop aspect at next signal. Call-on: Stop; operate track trip manual release. When trip clears, proceed expecting to encounter end of track or train ahead. Proceed on main route, expecting to encounter end of track or train ahead. Proceed on diverging route, expecting to encounter end of track or train ahead. Proceed on main route (to yard), expecting to encounter train ahead. Proceed on diverging route (to Evanston), expecting to encounter train ahead. Proceed on diverging route (to Skokie), expecting to encounter train ahead. To my knowledge, the signal aspects remain the same today.